I didn’t take any photos of the project when I first started so I’ll just talk through the first steps to get up to speed with where the photos start. I picked up some 10 ft. x 1 ft. x 2 in. boards from Home Depot to make the frames for the gardens. The plan was to have two 50 sq. ft. raised gardens. The dimension of the boards made building the frame quite easy. Two cuts (10 ft. / 2 = 5 ft.) was all it took for the smaller sides. Then I just screwed the sides together. Next I laid down some weed barrier, reposition the frames, and filled the frames with dirt I picked up from the Natural Gardener. Sounds simple and in reality it was, but Laura and I both got a good workout making the trips back and forth carrying the 5 gallon bags of dirt from the car to the garden. 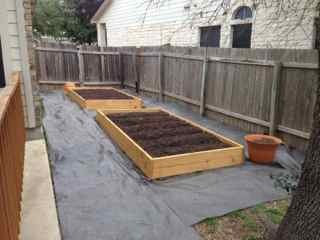 We ended up putting in about 2 ½ yards of dirt to fill the beds to our satisfaction. 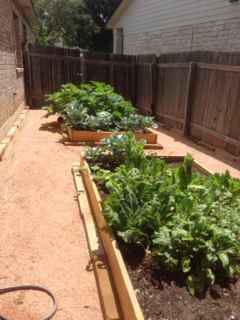 This also involved multiple trips to get all the dirt from the Natural Gardener, but it was spread over a couple of weekends so we didn’t bother renting a truck or paying a delivery fee. 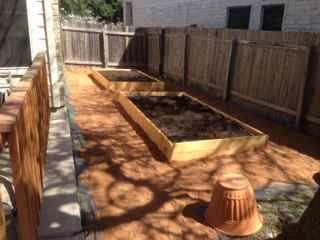 Here’s the first image that shows the garden just after we got all the dirt in it and planted our soon to be organic food source. I mentioned the order while doing the granite pathway was probably not ideal and since the materials came at the same time the same is true for the garden. I found the granite that I wanted to use before I found the bricks so I had that delivered and laid that around the garden frames. This added a bit of work when I finally found the bricks I wanted but it kept me busy. I had 7 yards of decomposed granite delivered which included the granite for the pathway. After finding the bricks I wanted (Texas Tumbleweed Tan) from Daniel Stone and Landscaping I purchased 2 ¾ tons. As I said earlier it required a bit of work to pull the decomposed granite away from the frames so the bricks could be laid but I really like the end result. Notice the growth! This was less than two months after planting. Here’s another look at the garden with a look at the step down. Laura had a nice idea for laying the bricks with a gradient to give it a more artistic look. 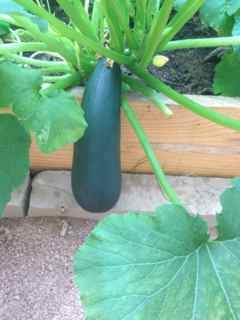 In no time we had more zucchini than we could eat! Here’s a shot when the garden was really going. We also had carrots, butternut squash, romain, radishes, beats, and some swiss chard. There’s some cauliflower in there too but we didn’t get any of that because the bugs kept gobbling it up. This zucchini was the first one we harvested. This monster zucchini came out of nowhere. We were just watering the garden one morning and this guy was falling out over the side. Remember the frames are a foot tall on the side. So that should give you an idea of the scale for this beast. As we learned it’s better to harvest them before they get too big or they will have large seeds. Nothing that bothered us and most of the time we went out to actually harvest some they were already huge! This was amazingly fun to make and to enjoy. It still is. We’re currently letting the garden rest for the remainder of the summer as it’s become too hot for anything to grow reasonably well, but we’ll be gearing up for our winter planting season in another month. 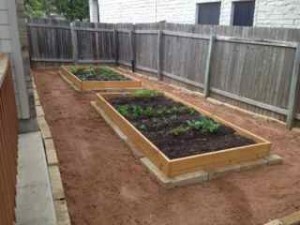 If you have any interest in starting a garden I would highly recommend going with a raised garden. You can add whatever soil you like and put it just about anywhere so you don’t have to deal with poor soil or the wrong amount of sun because of location. Also it was pretty cheap. 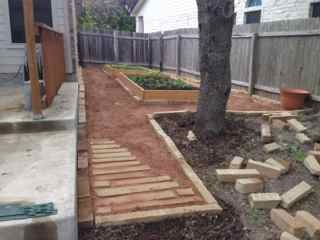 We built a pretty large garden but the materials for the actual garden came out to just about $200. The decomposed granite and especial the bricks increased the price a fair amount but that was more for appearance and if you do it like I did you can spread that cost out of a couple months or more.